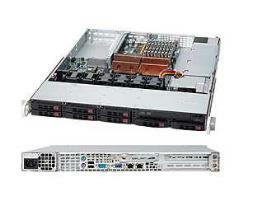 Acme PD-108TA2F DP LGA3647 socket P server, 1U rackmount, Black Color. 4 NVMe PCIe ports on motherboard. Dual 10Gigabit Ethernet Intel c622, RJ45 ports. VGA port- On-board graphics, AST2500. remote management -Integrated IPMI 2.0 V. KVM AST2500 dedicated LAN. 8 of 2.5" HDD hot-swap bays w/ backplane( 6 SAS/SATA + 2 SAS/SATA/NVMe option add NVMe cables).